Get high-quality energy efficient bay window replacement or bow window replacement in Chicagoland from the experts at Green T Windows. 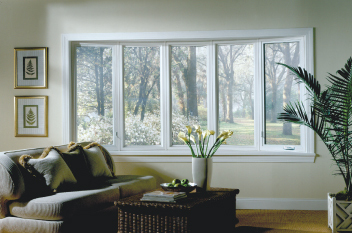 Bay & Bow replacement windows are an excellent option for large window areas of a home. They provide plenty of natural light and multiple views while increasing your home’s value as well as its heating & cooling efficiency. The vinyl frames of our replacement bay and bow windows keep heating and air conditioning from leaking out by forming a tighter seal and the Low-E glass of these windows reflects heat radiation while allowing natural light to pass through. These qualities will help to decrease the cost of your energy bills. Carve out your own special place by adding a new Bow Window or Bay Window to your home. Like a piece of finely crafted furniture, both Bows and Bays are elegant and create a dramatic look inside and out. All bay or Bow windows are handcrafted to your exact specifications, with every facet beautifully finished with the utmost attention to detail. Replace an existing Picture Window with a new Bow or Bay and complete your design with flair. Dress up your windows with options like V-Groove glass, designer grids, wood-grain finishes or genuine stain-able oak seats.